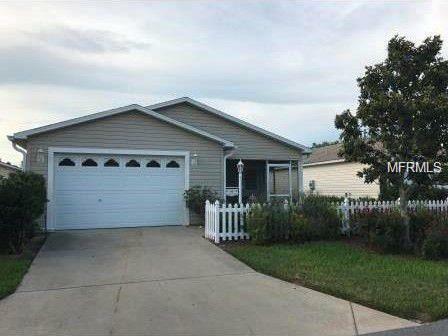 Great location in Fernandina Villas with Golf Cart - AVAILABLE FOR DECEMBER ONLY...Don't let this one get away Awesome location near 466!Nicely decorated two bedroom, two bath patio villa in the Village of Summerhill. The living room provides ample seating and has an open floor plan with a dining area that seats 6 comfortably. The kitchen provides everything you may need to prepare meals or visit one of the many eateries in the area. Each bedroom with a queen sized bed and plenty of closet space. The Villages has all the activities you could dream of. With The Villages guest ID's you have access to over 30 executive golf courses and 12 championship golf courses. There are also many recreation centers located throughout the villages for you to enjoy pickleball, tennis, shuffle board, bocci or more than 500 indoor activities and events! Don't miss the three town squares for shopping, dining or the live entertainment nightly in your golf cart!No pets none smoking.